Part 2: Rouhani on U.S. at U.N.
Rouhani also chastised the U.S. government for seeking regime change in Iran. “It is ironic that the U.S. government does not even conceal its plan for overthrowing the same government it invites to talks!” he said. Secretary of State Pompeo and National Security Advisor John Bolton say the administration’s policy is not regime change, but a change in behavior. But Rouhani did not close the door completely to negotiating with the United States on several issues--on condition that Washington embraces the nuclear accord again. In a particularly controversial remark, Rouhani charged that the world is now witnessing rulers “who think they can secure their interests better—or at least in the short-term ride public sentiments and gain popular support—through the fomenting of extremist nationalism and racism, and though xenophobic tendencies resembling a Nazi disposition, as well as through the trampling of global rules and undermining international institutions.” The following is a translation of Rouhani’s address followed by excerpted remarks from other interviews. (For Trump's remarks on Iran at the United Nations, click here). "Americans want Iran to have no security. They want to create chaos and turmoil and set the conditions so that they can return to the country one day and take charge as they did in the old days, but none of these is possible." LESTER HOLT: How much are the sanctions that have already been re-imposed-- how much are they hurting your country? And in what ways are they affecting your country? PRESIDENT ROUHANI’S TRANSLATOR: Sanctions has brought pressure upon the people of our nation. And at the same time it has made our exports-- it has augmented our exports. And our national production has seen a positive forward movement under these sanctions. The United States of America has brought all of its efforts to bear in order to trample upon all the norms and regulations of international trade. It has had the aim of bringing other countries, companies, and firms under pressure against international laws in order for them to cease their relationships with Iranian partners and entities. So there is a—duel, if you will, between Mr. Trump and those who seek stability, and security, and cooperation in the region. All other countries in our region with the exception of a couple of them, as well as worldwide, do not accept or approve of Mr. Trump's behavior and do believe that the JCPOA benefits the region as well as the international community worldwide as a whole. So it is an international effort. It is not just an Iranian effort. Many countries, the greatest majority of countries, accept our positions and approve of our positions. And we are hopeful that ultimately we will put this behind us and ultimately the United States will realize that on this path that it has chosen it is alone and from a legal standpoint, a diplomatic standpoint, the stan-- the standard of proper comportment, it has done everything erroneously vis-à-vis this issue and it has not benefited ultimately. LESTER HOLT: The secondary round of sanctions is scheduled to begin in November. The U.S. has made it clear that it wants to bring your oil exports down to zero. Do you think that will happen? And how will you respond if it does? PRESIDENT ROUHANI’S TRANSLATOR: First of all, the United States of America in action has already done what will take place supposedly November. In this very month of September it has brought tremendous pressure on many countries, those who are our crude petroleum customers and purchasers. So the appearance is that November is still-- some weeks away. But in the month of September, what was scheduled for the United States to do is taking place. But it was scheduled to be done in November. So the United States is not capable of bringing our oil exports to zero. This is an empty promise. And it's a threat that is empty of credibility. Perhaps on this path we will sustain certain pressures. But certainly the United States will not reach its objective. LESTER HOLT: Some of the statements from Iranian officials have given the impression that Iran might move to shut down the Strait of Hormuz-- to block all exports from the Persian Gulf. Is that something that you would consider? PRESIDENT ROUHANI’S TRANSLATOR: If the United States wishes to use force in order to sanction the petroleum industry of Iran, it will certainly see the appropriate response. We do have the power to secure our own waterways and keep our waterways free. And during the past many centuries, it has been Iran that has had an effective role in securing the safety and security of the waterways in the Persian Gulf, the Strait of Hormuz, and the Sea of Oman. And we will continue this role in the future. LESTER HOLT: Is that a warning to the Trump administration? Should they take it as a warning? PRESIDENT ROUHANI’S TRANSLATOR: This is not a warning. This is a reality. If the Persian Gulf waterway, which is to remain free and secure, it must remain so for everyone. "If Trump wants to talk to Iran, then he first should return to the nuclear deal." PRESIDENT ROUHANI’S TRANSLATOR: There is no such program for a meeting. Mr. Trump did not create conditions necessary to bring about the atmosphere conducive to a meeting. LESTER HOLT: He has expressed a willingness to meet with you. Has anyone reached out to you, to your office on his behalf to try to arrange a meeting while you were both in New York? PRESIDENT ROUHANI’S TRANSLATOR: Naturally if someone is keen on having a meeting, and holding dialogue, and creating progress in relationships, that person would not use the tool of sanctions and threats when a government brings to bear all of its power against another government and nation. That means that the necessary willpower is absent in order to resolve outstanding issues. LESTER HOLT: Mr. President, you and all of us witnessed the United States president, President Trump-- travel to Singapore and sit down with Kim Jong-un. A country that does have nuclear weapons. I'm curious how you view that meeting and if there was somewhere a model in there that-- that might broach an opening for dialogue between Iran and the United States. PRESIDENT ROUHANI’S TRANSLATOR: The North Korean model cannot be a correct model because we cannot draw such comparisons. But certainly there are different models out there that can be used, parts of which can be used in order to decrease tensions between Iran and the United States. This is in the hands of the Trump administration for it to cease its threatening behavior towards Iran and to return to the Joint Comprehensive Plan of Action. LESTER HOLT: So what are the conditions to resolve some of the issues you talk about that would allow you to meet? What would you like the United States to do as a first step to open up the opportunity for dialogue? PRESIDENT ROUHANI’S TRANSLATOR: In my opinion the United States of America, that same bridge that left behind and demolished with its exit and violation of the JCPOA and the language of threats, that bridge must be rebuilt in order for both countries to be able to set programs for such conducive atmosphere and for their mutual futures. LESTER HOLT: As you note, the United States has withdrawn from the-- from the nuclear deal. The other countries are still officially in the accord. Why are you still in the agreement? Why have you not now left given the U.S. exit? PRESIDENT ROUHANI’S TRANSLATOR: Well, the United States of America was hoping that with its violation of the JCPOA we would naturally exit the JCPOA as well so that the case could be referred to the United Nations Security Council and via the United Nations, Iran could be brought under sanctions again. However, the planning and the vision of Mr. Trump failed to materialize. Against the norms, he violated the JCPOA, and exited the JCPOA, turned the American government's back on U.N. Security Council Resolution 2231, and in reality trampled upon a resolution of the United Nations. Until such time that our interests are guaranteed with the five remaining countries, we will remain within the JCPOA. LESTER HOLT: That means you will adhere to the limits on uranium production. But what would happen if those other countries are not able to live up to the terms? Is Iran prepared to go forward with its nuclear program? PRESIDENT ROUHANI’S TRANSLATOR: Well, a one-sided agreement would be meaningless. If-- an agreement under which we would accept the limitations, we would also need to benefit from accepting certain limitations. So our remaining within the framework of the JCPOA would necessitate and would mean that the five remaining countries would need to adhere to their commitments and duties as well. LESTER HOLT: The U.S. released its annual terror report recently. And it found Iran was one of the worst offenders-- supporters of terrorism. How do you respond to their continued complaints and concerns about your support-- Iran's support for Hamas and Hezbollah? PRESIDENT ROUHANI’S TRANSLATOR: I do believe that Saturday's event in Ahvaz clearly responds to these U.S. allegations. The United States only in words says that she’s against terrorism. But in actions it is not so. Countries, governments in our region whom support terrorism, terrorism that is against the Iranian nation, terrorism that is against the Syrian nation, or the Iraqi nation, or Yemen, these countries have very tight relations and close relations with the United States of America. And I ask you-- all of the bombs falling on the Yemeni people that are being used against them on a daily basis, where do they come from? The airplanes that carry the ordinance that target Yemeni people, where do they come from? The weapons and weapon systems found in the hands of Daesh or ISIS in Iraq and Syria, many of them were U.S. manufactured and made. So only in words they express as being against terrorism. But in action, unfortunately, we see that they do support terrorists. This double standard must be set aside by the United States of America. If we see terrorism as a danger for world stability and world peace, which indeed it is so, then all of us must correctly and straightforwardly combat terrorism. The United States of America names those who are today fighting ISIS in Iraq and Syria as terrorists. If Daesh or ISIS is a terrorist group, then what do we make of those whom are fighting against ISIS or Daesh? Then you cannot name them both terrorists. The terrorists, as well as those that are fighting against them, are both terrorists? It cannot be so. Not in Syria. Not in any country. So there is a gap between the comportment and the expressions of the United States of America. LESTER HOLT: So let me be clear here. Do you think the United States supported the groups that-- that launched the attack at Ahvaz that killed dozens of people? PRESIDENT ROUHANI’S TRANSLATOR: The United States of America-- yesterday one of the American officials clearly and openly supported these terrorists. Said that in Ahvaz-- if something took place, Iran must not seek the roots of that terrorist attack in other countries. It brings to bear the comportment of the Iran government. So in other words, what they're saying is that the United States of America justifies terrorist activity, and supports such activity, and sees the cause of this activity as the government of Iran. If this is indeed so, if this train of thought makes sense, how do we apply the same logic to the terrorist attacks of September 11th? How would we view it? How would we view the terrorist attacks perpetrated on Paris, on Brussels? So, in other words, the terrorists are innocent and the governments are guilty? And the terrorists are fighting for their own objectives, and the governments are guilty of not capitulating to them? 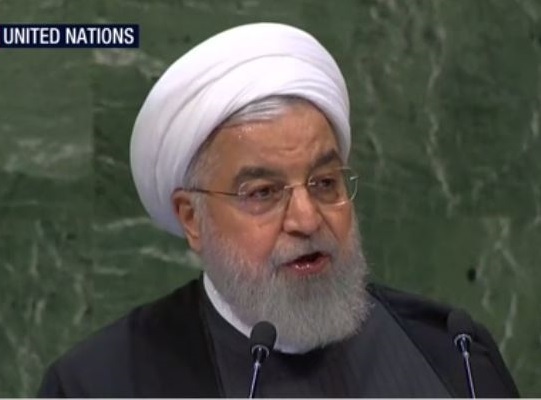 Yesterday, in the United Nations it was clearly announced that the United-- that the Islamic Republican of Iran must surrender to these terrorists. And this was quite an embarrassment for them. LESTER HOLT: I want to ask you about Syria. And-- I want to ask you what Iran's end game is in Syria. How does this end? PRESIDENT ROUHANI’S TRANSLATOR: In my opinion, the trend in Syria in the past few months and in the past few years has been a good one. The terrorist groups have suffered continuous defeats. Many of the cities throughout Syria have been freed from the hands of terrorists. The capital of Syria, Damascus, today is much more secure and safe than at any time in the past few years. So the terrorists have lost much territory and currently hold very little territory. More than 90% of the Syrian territory is under control of the Syrian government. So the cooperation between Iran, Turkey, and Russia has been quite effective. This cooperation has been very effective thus far and very positive for Syria. And our efforts are on creating a cooperation and a dialogue between the government of Syria and the opposition groups based upon which a new constitution can be written, based upon which then elections can be held that will determine the future Syrian government. So our future expectations for Syria is increased freedom, reconstruction, democracy, and the repatriation of those that were driven from their homes. LESTER HOLT: If Assad is ultimately successful, does Iran exit? At what point does Iran withdraw from Syria? PRESIDENT ROUHANI’S TRANSLATOR: Our presence in Syria has only to do with the will of the Syrian government. From the very beginning when we entered Syria was based upon the invitation of the Syrian government, based upon which we sent our military advisors there. And our fight was focused against terrorists. Whenever terrorists are defeated in Syria and terrorism ceases to exist in Syria, and the government of Syria has no need for us, then at that point our continued presence in Syria will not have any meaning or serve any purpose. Click here for Trump's remarks on Iran at the United Nations.